Pouty Hugo: "I Will Not Speak to Uribe For As Long As I Live"
Poor Hugo- It’s been a rough month. He failed at stealing an election and neighboring President Alvaro Uribe put a freeze on his FARC fun. Tender Hugo is so hurt he’s still lashing out at the Colombian president. 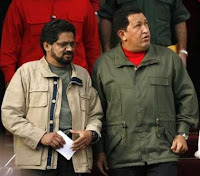 “As long as I live, I have nothing to speak to traitor and bluffer, (Colombian President) Mr. (Álvaro) Uribe,” said again President Hugo Chávez and noted the relation between his government and the Argentinean government. “I came to visit a president who is starting and should be supported to secure the bilateral relation,” Chávez told reporters after a meeting with Argentinean incoming President Cristina Fernández, who took office last Monday. That Hugo… Always the statesman.